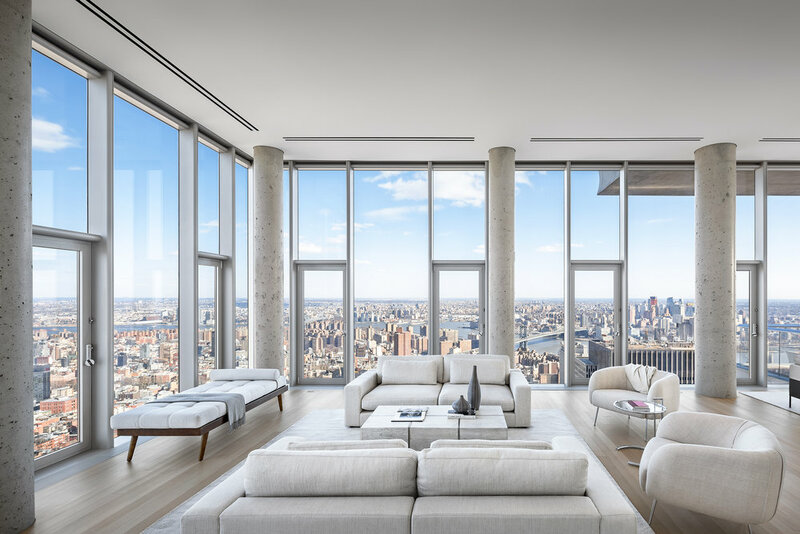 At over 700 feet in the sky, Penthouse 57, which is listed for $29.5M is now fully furnished by Jane Saidenberg of studio D, the boutique bi-coastal home staging and interior design firm. 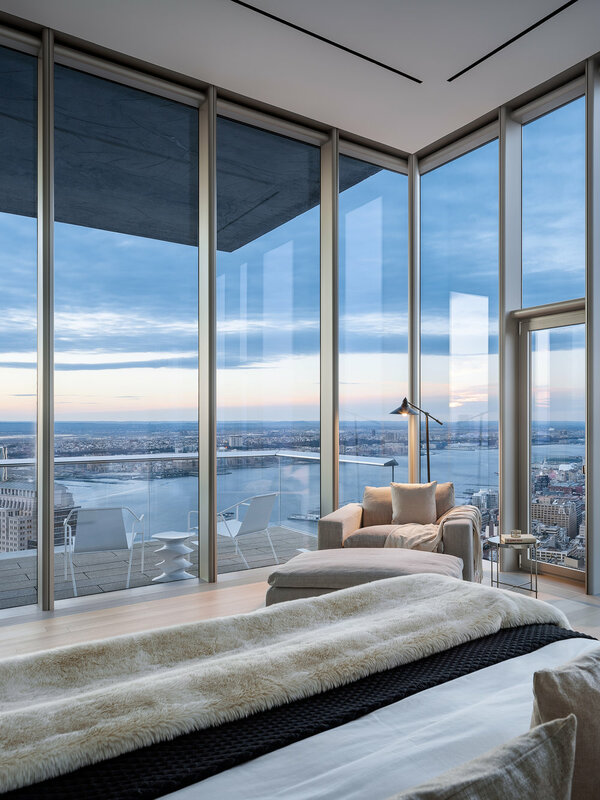 With custom exterior and interior design by Herzog & de Meuron, it has been compared to a glass villa, free-flowing much like a California modernist house in the sky, with 14' ceilings and 14' foot window walls in every room. A 5,252 square feet, 4-bedroom, 4.5-bathroom home with 1,763 square feet of outdoor living spaces spread across three sizeable terraces and balconies. Views in all four directions of New York span river to river and as far as the Atlantic Ocean, the spires of midtown, the iconic downtown skyline and over a dozen bridges. Forming an axis, the highly unique skyline view gallery offers uninterrupted views to the north/south/east/west from a single center point of the home. Sprawling entertaining spaces span five distinct yet free-flowing zones along the north/east/south wing of the floor; these include: Great Room, Library with venetian plaster wood-burning fireplace, Den, Dining Room and Kitchen. The open kitchen features a sculptural Absolute Black granite grand piano shaped kitchen island with custom-sculpted floating vented hood cover. The corner master bedroom suite enjoys a private terrace with sunset, Hudson River and skyline views, an oversized, windowed five-fixture master bathroom of travertine and Thassos marble with radiant heated floors, a steam shower with built-in tile bench and dual shower heads and a free standing soaking tub. Three additional corner bedroom suites enjoy ample storage and en-suite baths. Private elevator entry, solid appalachian white oak floors, and the ability to control a/c and heat all year within different zones. A 1,200-square-foot South and East facing wrap-around terrace with seamless indoor-outdoor entertaining, and could easily seat 30+ people for a formal dinner and has views from Midtown to the Atlantic Ocean with vast expanses over the East River and Brooklyn.